Firstly, this post mentions a very few graphic descriptions in reference to September 11th. If you do not wish to read on, that is okay with me. You may have noticed that my choice in literature as of late has been decidedly macabre – and I’m enjoying it very much. Since stumbling onto The Order of the Good Death, I have discovered a world of death professionals whose conversations surrounding death culture have been particularly enthralling for me, namely because such conversations are absent from the mass-mind of society. I guess why it made so much sense for me to be attracted to this community, their message, and their works is because 1) I’ve always been haunted by my own mortality. More so than most of my close friends, at least. I think it has to do with being a slightly anxious person and being a person who can sit and think for long periods of time on one particular subject, and 2) I’m writing a long-ish story (like it’s a novel but I know that out of the 300 pages I have so far, 150 of them are utter garbage and will have to be tossed) and was struggling with one of my major themes. It was during this struggle that I discovered this death community and had a very important realization: death culture was something I greatly desired to explore through my writing. I had been attempting to and attempting to, but it was a beautiful moment when I realized what I was trying to get at all along. Somehow, with the abundance of literature available, the right book always seems to find its way to you at the right time. I have been fortunate in that regard. But I digress – I wish to spend the rest of this post in regards to one ‘death’ book in particular, and that is Working Stiff by Judy Melinek, M.D. and T.J. Mitchell, which I’ve just recently finished. Dr. Melinek is a medical examiner who, at first, was pursuing a career in surgery until the rounds became so heinously long (that is another subject entirely – our doctors are not sleeping! This is so dangerous – how can we expect them to be meticulous, amazing surgeons?!) that she decided, with the support of her husband, to pursue a different course of medicine for the sake of her physical health and mental wellbeing. Dr. Melinek’s text focuses primarily on her two years spent as a medical examiner in New York City, where she endeavored to examine 262 bodies. These are the bodies that she spends most of her time divulging details about to the reader, though I should make a correction and clarify that these are not just ‘bodies’ – bodies might belong to living people. These are corpses, and corpses can only belong to a dead person. Corpses are strikingly different from bodies. I think you would agree. Most of us, I’d presume, are terrified of corpses. They are so other; they are so unlike us living, breathing beings, who can think and feel and love and hate. And Working Stiff certainly makes this distinction clear. Take the corpse that once belonged to a man named Andres, whose skin on his face “hung off in greenish-gray rags” and whose body was “covered in a shiny slime and mottled in patches of brown, green, white, and yellow.” Sure, us living bodies may get bruises, but certainly our entire outer layer of epidermis does not slide off “like the rind of a rotten fruit.” All of these traits, combined, alert us that this is a severely rotten corpse that belongs to a decedent. Death is part of the human experience, and to acknowledge it and accept it is to embrace that experience, and it becomes a fear no longer. It is a powerful and difficult thing to do, however, and it is so difficult because death is tragic for those that survive it; one of Dr. Melinek’s most important duties in her line of work, she says, is to be there for the survivors. There’s a third fatality category that exists, alongside the “dangerously mundane” and the “predictably hazardous” and though it as not as common as the former two, perhaps, it is the most terribly hard to bear: this is the “unpredictably tragic.” Dr. Melinek spends a very intimate part of her book detailing her experience of identifying the bodies of the September 11th victims. This, to me, is the saddest category of all. The magnitude of this particular tragedy is infinite, as we all know; the amount of victims Dr. Melinek is tasked with identifying and examining is certainly unbelievable, and she recounts how “four diesel-powered, refrigerated tractor-trailers” had to be brought to the New York City medical examiners (plural – examiners from all boroughs, as well as DMORT, the federal Disaster Mortuary Operational Response Teams, who came together to assist in the tragedy, mostly to identify bodies) in order to store the massive amounts of remains. If it is wrong to argue with Ann Radcliffe, forgive me, but at least del Toro would probably agree; in Working Stiff, Horror does not act as a mode of annihilation, but as a mode of enlightenment. While the violent fate that has befallen these victims can be sickening to comprehend, made real by the utterly horrific descriptions their corpses, to soften their descriptions, or to make them more digestible, would be an incredible disservice to the trauma they experienced. It would also harm us, the living, for being sheltered from such realities prevents us from contemplating them as they are. Thankfully, Dr. Melinek refrains from this. Many of the deaths described in Working Stiff are atrocious. Perhaps if they were not so, many readers would not feel so pricked to read about them (we are a very curious and morbid and nosy sort, the human race). Many of these deaths are horrible, in every sense of that word, and they are most certainly tragic. But these corpses are our very intimate mirrors for self-examination; for our future. And because Working Stiff allows us to examine them much more closely than we would ever have the chance to otherwise, we are able to “contemplate the experience of death in absolute safety,” which is something that maintains our humanity. For to ignore death is to ignore part of the human experience, and severing the shadow from the soul has tragic consequences of its own. 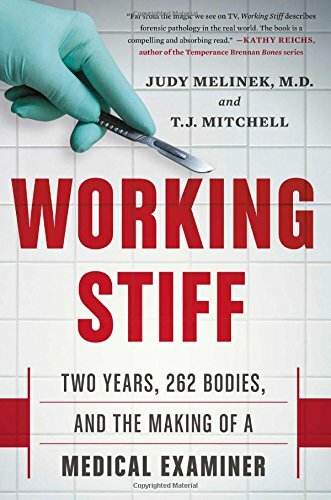 Working Stiff by Judy Melinek, M.D. and T.J. Mitchell.